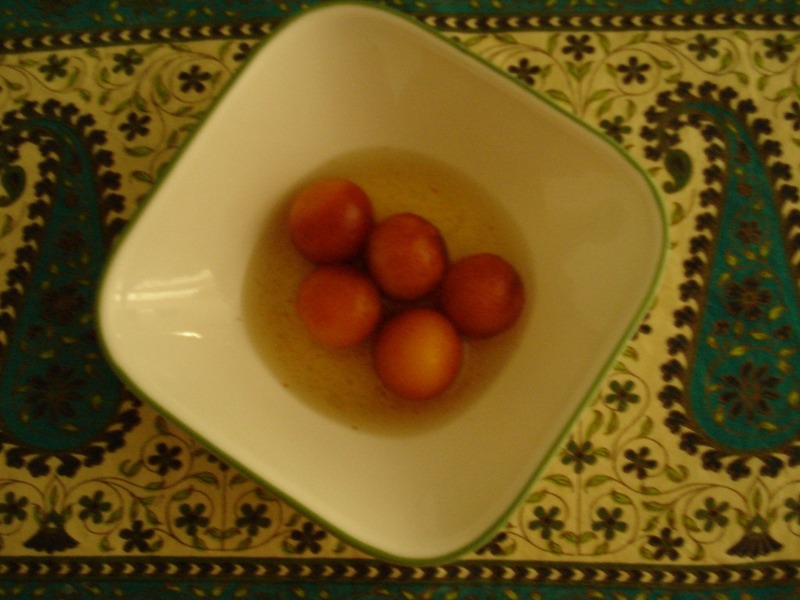 Wheat Free Gulab Jamuns | Can't Believe It's Allergy Free! Diwali is here! This traditional favorite is quick and easy to make, and can be enjoyed by all. These delicious gulabjamuns are gluten free, and when they taste just as good, why even make the conventional wheat containing ones? Add one and a half teaspoon ghee, leaving half teaspoon for later use. Mix half of the yogurt and add the remaining as needed, to make a medium-soft dough. You may require the extra amount, depending on the texture of the milk powder. Knead well so that the dough is very smooth.. Smear a little ghee on your hands as you knead, to prevent the dough from sticking to your hands. Rub just a little extra ghee as you form small balls (about 18), with the dough. Cover balls with a clean damp cloth or moistened paper towel. Heat oil in a medium size wok, and allow oil to heat well, keeping flame on low..
Drop a small bit of dough into the oil to test readiness. The dough should rise to the surface and fluff up a little. Fry jamuns on low heat, a few at a time, till they are a rich, golden color. Remove from oil, holding the balls with a slotted spoon against the side of the wok, so that most of the oil will drain. Place on a dish lined with paper towels. To prepare the syrup, combine sugar and water and place on medium high heat. Remove from heat and add elaichi powder. Gently drop the fried balls into the hot syrup and set aside. In about an hour or so, they will partly absorb the syrup and fluff into larger, spongy balls. Warm the gulab jamuns a little before serving, or enjoy them at room temperature—either way they taste great!